· Orchard road is the popular-most shopping street as it is packed with many malls that sell products of all kind. Besides, it is home to many departmental stores and outlets that sell company quality products to travelers at discounted prices. · Sim Lim Square is the home of technology and I.C.T. Items to look out for here include; laptops, custom desktops, LCD monitors and televisions. The best thing about the mall is that it is among the few that offers tax-free shopping for tourists. 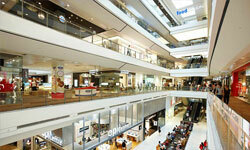 · VivoCity, which carries the title of ‘the largest shopping mall in Singapore’, majors on fashion and clothing. It borders Sentosa which famous for offshore sun tanning and sight-seeing. VivoCity also houses a series of restaurants and boutiques that sell branded goods. · Paragon is a unique mall as it is the only one that entirely deals with branded goods. Ralph Lauren, Hugo Boss, Gucci and Guess are some of the top brands sold here. · China townhouses shops that sell Chinese products and restaurants filled with Chinese delicacies. Here, it is in the best interest of any shopper to bargain as traders are very ambitious. Other shopping malls include Heeren, OG Albert and Bugis street. · Every year, between May and June/July, Singapore holds the Great Singapore Sale (GSS) which attracts a huge number of shoppers. During this time, travelers enjoy up to 70% discount on goods. · The annual Chinese New Year Sale runs from January to February. This is the best time to shop for diverse goods from the Chinese culture. · The Christmas Sale, held on December, is a great opportunity to combine family shopping with fun and entertainment. While shopping in Singapore, it is imperative to know that goods and services tax (GST) stands at 7%. Therefore, shoppers should confirm to avoid being over-taxed. Credit cards to carry when visiting Singapore include Visa, American Express, Diners and MasterCard. Besides shopping, Singapore is home to many nightspots that are an epitome of entertainment. They include Zouk. Clark Quay and ST James PowerStation. Every year, many tourists flock Singapore for holidays, shopping and entertainment. All the destinations are easily accessible by use of MRT or taxi. If unsure about the precise destination, Google Earth offers an exact solution. Finally, as travelers experience the best of the city, they should be careful to check prices before buying and only change money from credible dealers.